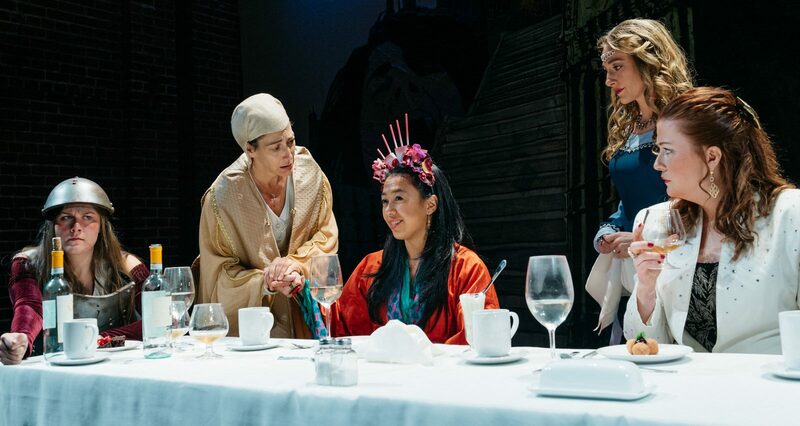 The opening act of Caryl Churchill’s 1982 “Top Girls” is still breathtaking as women ranging from the ninth-century Pope Joan to 13th-century concubine Lady Nijo and Victorian-era explorer Isabella Bird gather for a vivacious dinner party hosted by a modern employment agency manager who is celebrating a promotion. The final act of Thatcher-era class warfare knifes into our Trumpian divisions as sharply as anything in Jon Robin Baitz’s absorbing new “Vicuña.” It’s a masterful work. In the new Keegan Theatre staging, director Amber Paige McGinnis guides her cast through the choppy waters of that sometimes hilariously busy and fantastical first act. These women all have vivid stories to tell and no shortage of opinions.